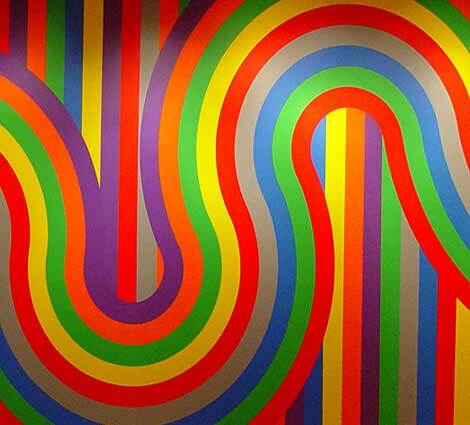 Sol LeWitt's Wall Drawing #1136, (2004) is currently on show at Edinburgh's Museum of Modern Art, and is well worth a look. Spread over three walls, it was constructed by members of the gallery team, according to the late artist's instructions (LeWitt died in 2007). The painting features a swirl of vector strokes cutting their way through a vertical background of coloured stripes, and evokes a 60's vibe, reminding me somewhat of the artwork in the Beatles' film Yellow Submarine. Like all of LeWitt's work, it seems very simple but it has a hypnotic quality about it, and up close there is an immense sense of optimism and freedom, as if lines and colour are really all that matters. LeWitt was a leading exponent of the Conceptual and Minimalist movements in America, and his work is reminiscent of both Mondrian and Kandinsky. He specialised in vector-like geometric canvases, generally painted directed onto public surfaces, so that at museums, the work only exists for the duration of a given exhibition. Luckily the artist painted many permanent murals, especially in the States, and there is a semi-permanent exhibition of his work at the Massachussets Museum of Contemporary Art, which runs until 2033. The exhibition in Edinburgh runs till November 2012.